Friends of Fogelberg III with proceeds going to the Don and Sybil Harrington Cancer Center of Amarillo, Texas. 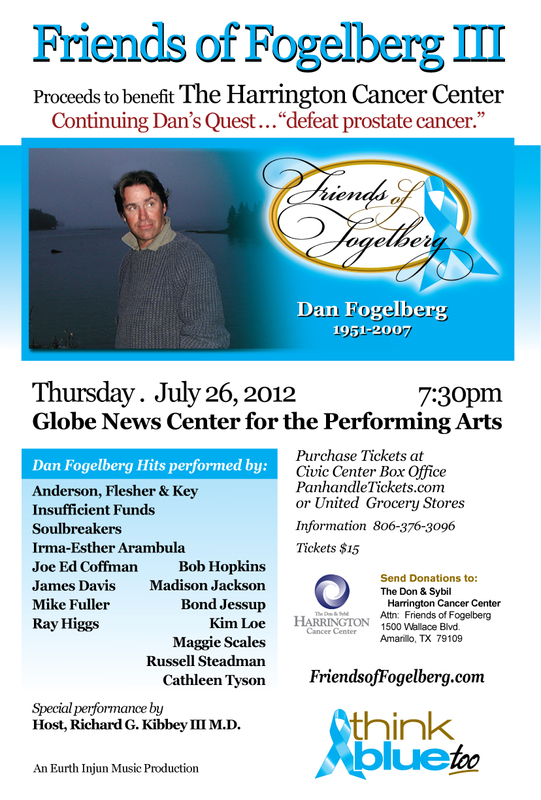 Musicians honor Dan Fogelberg by playing his music while raising money in the fight against Prostate Cancer. Dan lost his life in 2007 to the same disease. Friends of Fogelberg wants to raise awareness for early detection to save lives. Our new campaign is “Think Blue Too!” for Prostate Cancer. While we remember “Think Pink” for Breast Cancer, the door opens to support men in this fight against Prostate Cancer. Make your plans to come hear a stage full of musicians give of their own time and talent to raise money! It’s going to be a great night at the Globe News Center for the Performing Arts in Amarillo, Texas. Host, Richard G. Kibbey III M.D. This entry was posted on May 26, 2012 by Friends of Fogelberg. It was filed under Amarillo, concert, dan folgelberg, friends of fogelberg, fundraising, Harrington Cancer Center, prostate cancer, Putting for prostate, Texas and was tagged with amarillo, cancer, concert, Dan Fogelberg, friends of fogelberg, Harrington Cancer Center, prostate cancer.